Fr. Eduardo Andres Agosta Scarel , O.Carm., Ph.D. with students who attended his talk. Called Pope Francis’ Climatologist, Fr. Eduardo is on the faculty at the Argentine Pontifical Catholic University’s School of Sciences and Engineering. He holds a Ph.D. in Atmospheric and Oceanic Sciences from the Buenos Aires State University and has done extensive research on the climate and climate change. In addition to his scientific work, he reflects on the relationship between science and faith, and between spirituality and ecology. Since 2008 he has been a member of the International Commission of Justice, Peace and Integrity of Creation of the Carmelite Order (Rome), and is a consultant to the Earth, Society and Environment Pastoral Section in the Latin American Council of Catholic Bishops (Bogotá). He also is a member of the Coordinating Team of the Carmelite Non Government Organization (New York) and its representative at the United Nations Framework Convention on Climate Change. 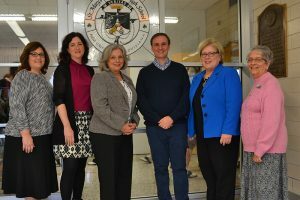 St. Mary’s Dominican High School Leadership Team (from left) Jamie Lassere (Vice President, Advancement), Catherine Thomson (Chief Financial Officer), Carolyn Favre (Principal, Vice President, Instructional Area), Fr. Eduardo Andres Agosta Scarel, O.Carm., Ph.D., Dominican President Dr. Cynthia Thomas, and Sr. Patricia Harvat, O.P., (Vice President, Dominican Catholic Identity). As an Argentinean priest, he was friends with the former Archbishop Bergoglio of Buenos Aires, Argentina (now Pope Francis) and worked with him on environmental issues. Fr. Eduardo was involved with preparatory consultations on the Pope’s encyclical letter, Laudato Si’: On the Care of Our Common Home. Pope Francis chose as his namesake Francis of Assisi, the patron saint of animals, saying the saint’s values reflected his own. The encyclical, published June 18, 2015, is a pastoral call to change the way people use the planet’s resources to ensure they will meet future generations’ needs. It is not a technical guide on how to allocate user rights for the atmosphere. Fr. Eduardo credits Pope Francis as “shedding more light upon the ethical dimension of the ecological problem and providing us with fundamental principles to be applied for solutions. The encyclical offers four fundamental principles to take action: the preferential option for the poor, the most vulnerable to our global actions against nature; inter- and intra-generational justice – “What kind of world do we want to leave for those who come after us?”; the common, but differentiated responsibility among the nations (We are all in charge of looking for solutions, but not evenly responsible); and orientation to the common good in order to preserve nature and guarantee social justice. 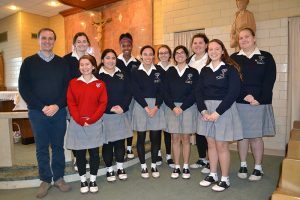 In addition to speaking at Dominican, Fr. 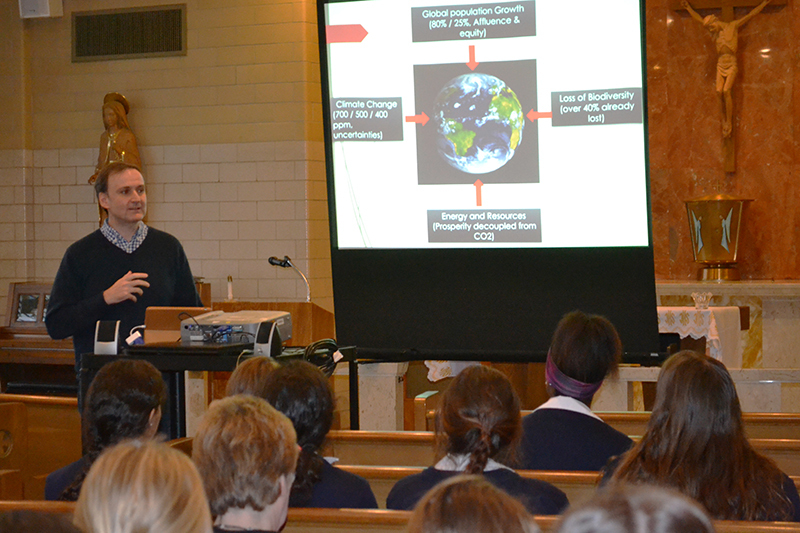 Eduardo spoke at Mount Carmel Academy, and to the New Orleans Archdiocese Brothers, Sisters and Priests.